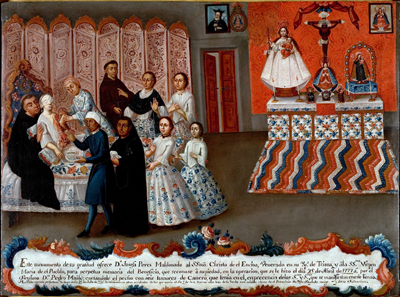 The painted ex-voto tradition was introduced to the New World by Spanish settlers in 16th century Mexico. 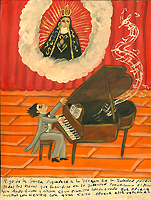 As it had in Europe, the creation of ex-votos began when wealthy patrons commissioned formally trained artists to create small devotional paintings. 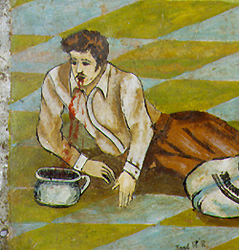 Ex-votos created through the 18th century were primarily painted on canvas, but as the tradition became popular with the masses, the practice of painting ex-votos on tin developed. Tin was inexpensive and readily available making it an accessible medium for local artists. 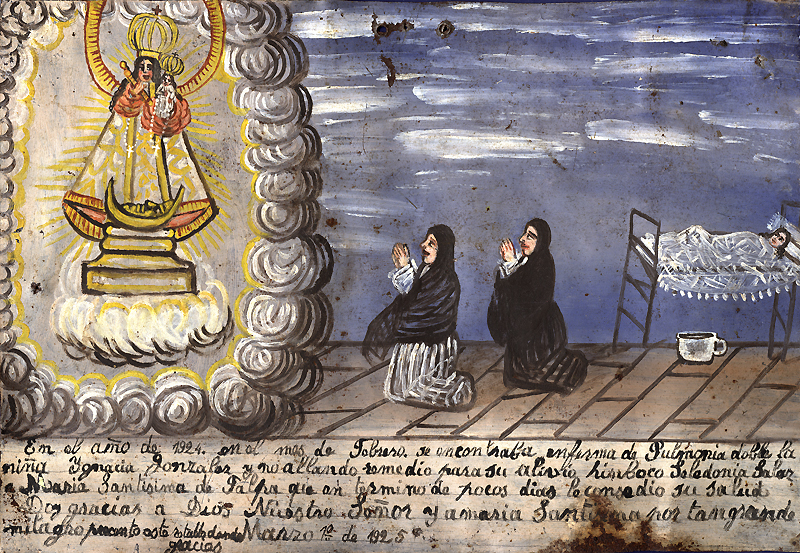 Although the ex-voto experienced a decline in the 20th century, a form of this personalized expression of thanks continues to be created today. "We dedicate this with gratitude to the Lord of Mercy and Reincarnation of God for having listened to our pleas for goodness. A strong hemorrhage of blood by the mouth and nose, we give infinite thanks for the favor he has granted and we make public his miracle this day the 15th of November 1939. Emilio Perez and Candelaria Velasquez." A man bleeding from his nose and mouth lies on his side while spitting blood into a small basin. A woman offers him comfort and support. This ex-voto places the narrative at the top rather than the bottom making it vary slightly from the standard form. 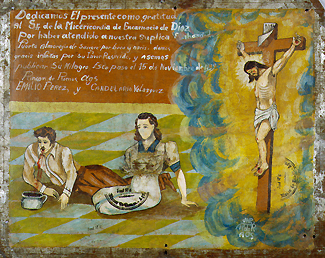 "Doña Josefa Peres Maldonado offers this monument of her gratitude to the Most Holy Christ of Encino, venerated in the Church of Triana, and to the Most Holy Virgin Mary of El Pueblo, in perpetual memory of the benefit, due to her piety, that resulted from an operation that took place on 25th of April 1777, when the surgeon Don Pedro Maillé removed six cancerous tumors from her breast, in the presence of the gentlemen and ladies depicted on this canvas. Although the wound closed perfectly on the 25th of July 1777, other accidents befell her from which she died on Friday, the 5th of September, at 3 p.m., with clear signs of the patronage of the Holy Image and of her salvation." 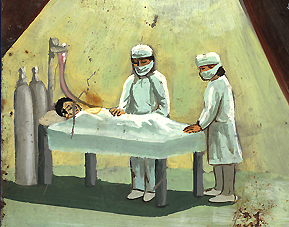 The Peres Maldanado ex-voto shows a woman undergoing breast cancer surgery. 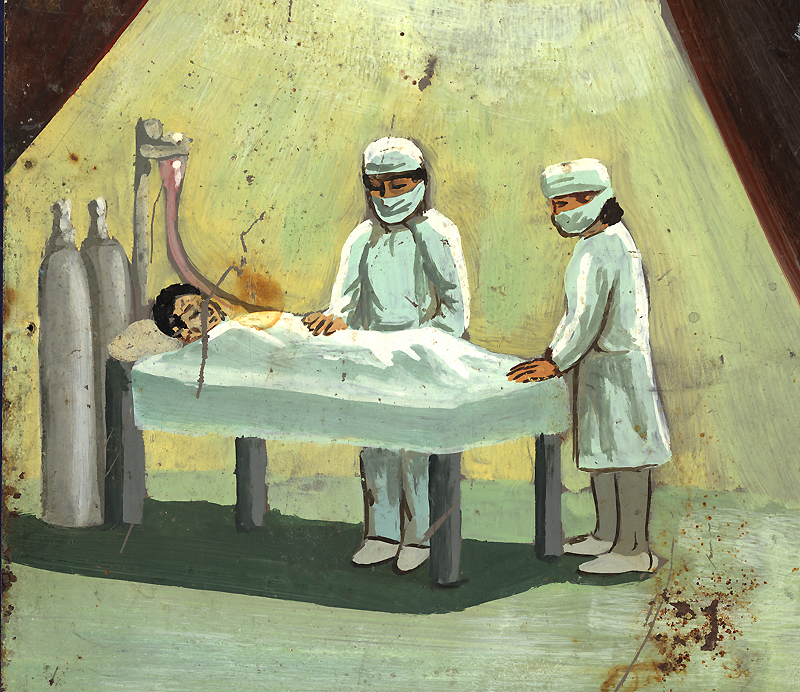 Surrounded by her surgeon, religious leaders, female family members, and attendants, Doña Josefa calmly and serenely lies in bed as the surgeon performs a mastectomy using only a scalpel and scissors. Her calm expression reflects her transcendence of pain and suffering through her faith and devotion. This depiction is unusual both in its frank illustration of cancer treatment and its depiction of multiple religious icons rather than the usual single religious figure. "In the year 1924 in the month of February. She was ill with double pneumonia the girl Ygancia Gonzalez and not finding a cure to alleviate it, Saladonia Salor called out to our Most Holy of Talpa, in a few days...her health...give thanks to God Our Lord and the Most Holy Mary for such a great miracle. 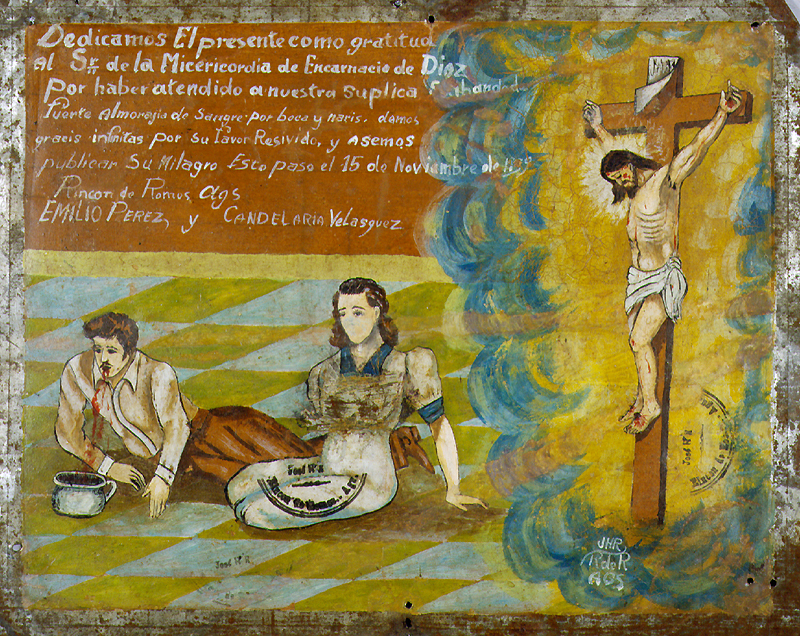 We present this retablo as thanks, March 1st, 1925." A pale serene young girl suffering from double pneumonia as she lies in bed while two female relatives kneel in supplication to Our Lady of the Rosary for the girl's recovery. After treatment failed to improve the girl's condition, prayers were offered for a healing. 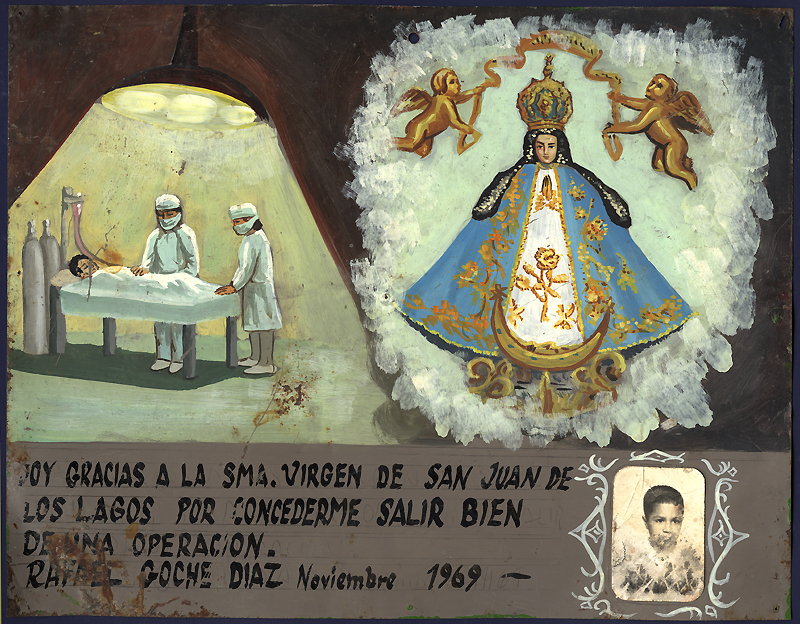 After a few days, the girl's health was restored and this ex-voto was created to give thanks for "such a great miracle." "I give thanks to the sma. Virgin of San Juan of the Lakes for granting me to come out well from a surgery. 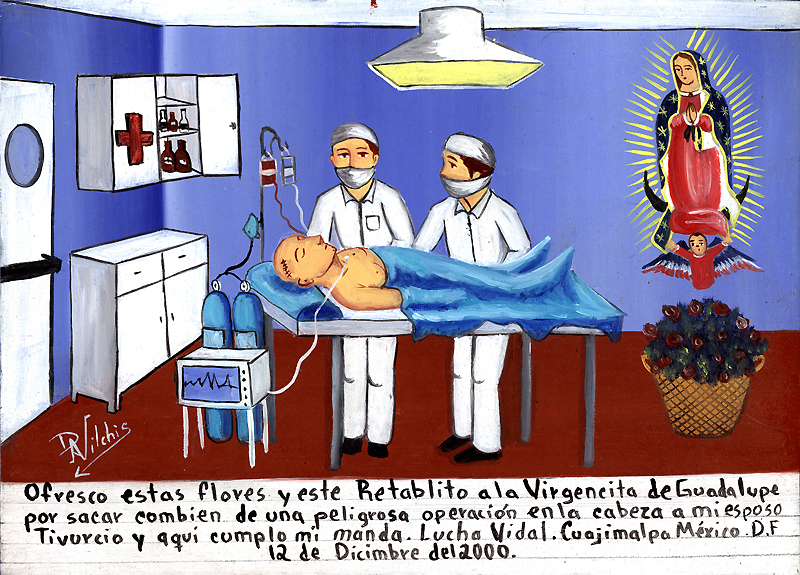 Rafael Goche Diaz November 1969"
This modern ex-voto gives thanks for the recovery of a young boy from an operation. 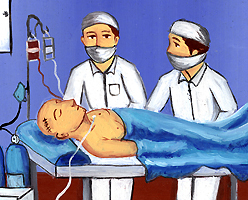 Two surgeons are shown in their scrubs and surgical masks while the boy lies on the operating room table connected to modern medical equipment. 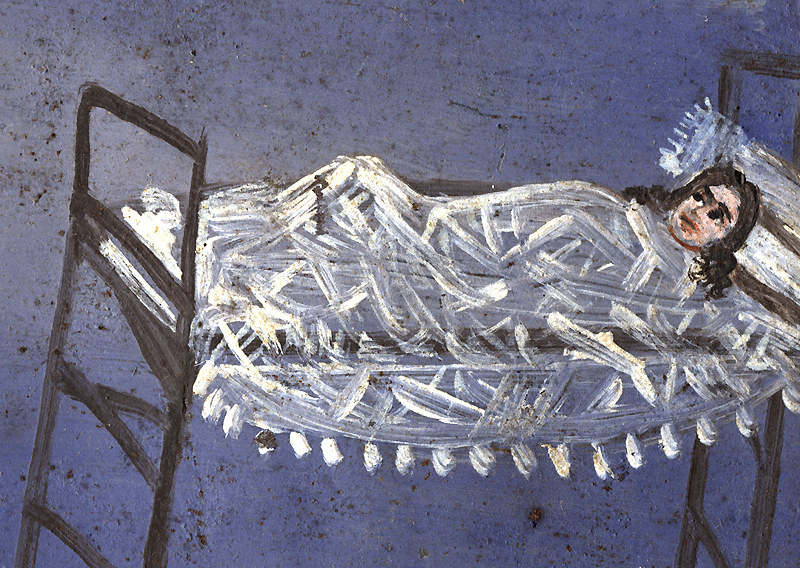 The large image of the Virgin indicates her importance in the miraculous recovery of this child. The small photograph of the boy at the lower right illustrates the introduction of modern media in this ex-voto composition. 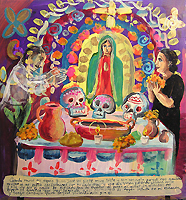 "I offer these flowers and this retablo to the Virgin of Guadalupe for taking care of a dangerous operation on the head of my husband Tivurcio, and thus I keep my promise. Lucha Vidal, Cuajimalpa, Mexico DF 12 December 2000." 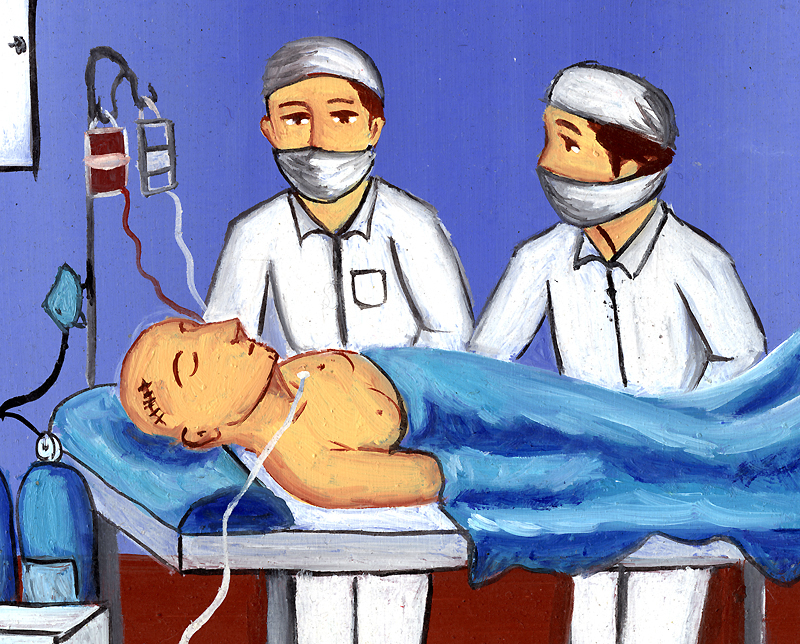 Tivurcio Vidal lies on a hospital operating room table where two surgeons have just performed successful brain surgery. Modern medical equipment can be seen near the table while the Virgin of Guadalupe, patron Saint of Mexico, watches over him. A basket of roses, a symbol of the Virgin's miracles, can be seen below her. 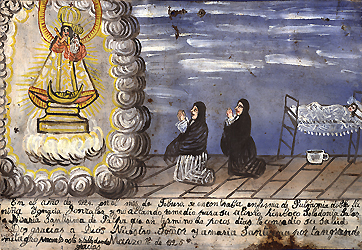 This ex-voto captures the form and function of earlier historical ex-votos, but reflects a new practice of identifying the ex-voto creator with a signature seen here in the lower left hand corner. 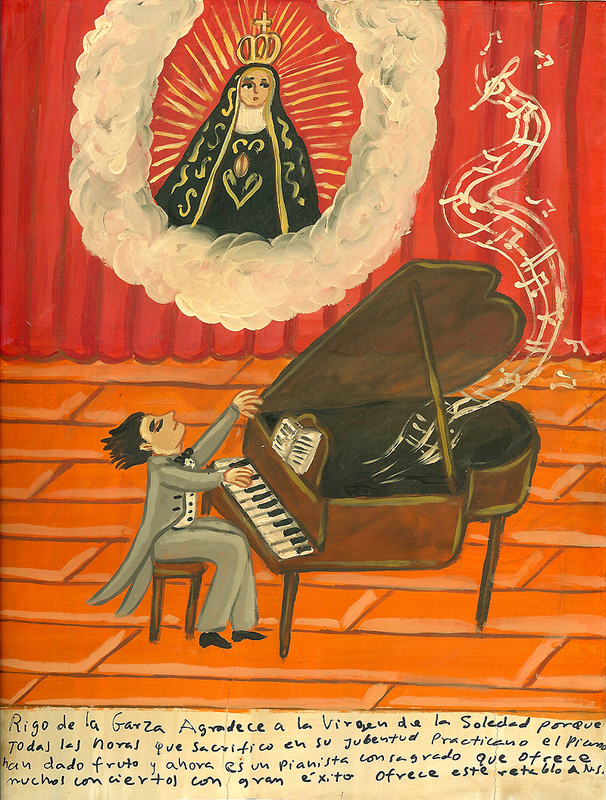 The ex-voto's popularity as an expression of the faithful experienced a decline in the 20th century though individuals still commission artists to create them. 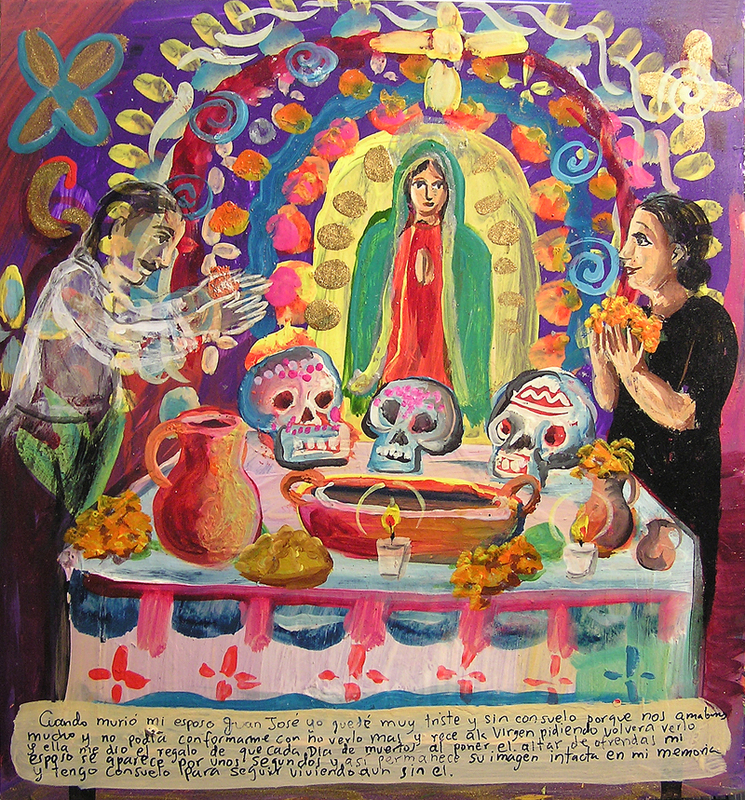 Most ex-votos remain a personalized expression of thanks for a healing or a restoration of health, but their purpose has expanded to include the commemoration a special event or to address a concern in an individual's life. They continue to be a reflection of a tradition where faith and healing play a vital role in daily life.